This short passage, "The One-Practice Samadhi” is from the Mohe Zhiguan 摩訶止観, in Sanskrit Great śamatha-vipaśyanā which is a key Tiantai (Japanese Tendai) source consisting of lectures given in 594 by the Chinese Buddhist sage Zhiyi translated by Ziporyn, Brook A..in Emptiness and Omnipresence (Indiana University Press) (pp. 273-274). This is the Stillness-Awareness [zhiguan 止觀, the standard Chinese translation of the Buddhist meditation term samatha-vipassanā] of the mind for this practice: sit upright and mindful, eliminating any disturbing sensations, abandoning any unruly ideations. Without thinking about anything else, but also without grabbing hold of any particular forms and appearances, just fix your mind exclusively on the Total Field of All Phenomena,1 letting each moment of experience be entirely identical to the Total Field of All Phenomena (xiyuan fajie, yinian fajie 繫緣法界, 一念法界). Fixing the mind on it is the Stillness; letting each moment of experience be entirely identical to it is the Awareness. Trust that all phenomena without exception are aspects of Buddhahood. As such, none can be prior to or subsequent to any of the others, as there are no longer any genuine boundaries between them. Thus there can be no separate knower or describer of them. But in that case, nothing can be definitively described or known about them. Hence they cannot definitively exist or not exist, cannot be a knower or a non-knower, cannot, for that matter, be known or unknown. Free of the duality of these extremes, they dwell only in their not dwelling exclusively anywhere or in anything, just as the Buddhas dwell in their secure and peaceful Nirvana, the quiescent extinguishment that is itself also the Total Field of All Phenomena. In thus contemplating the Tathāgata, do not regard the Tathāgata as the Tathāgata. There is no definite Tathāgata available anywhere to be the Tathāgata, nor is there any definite Tathāgata-wisdom with which he might know himself, for between the Tathāgata and his wisdom there is no attribute of duality, of motion, of beginning. They are neither in space nor lacking in any part of space; neither in past-present-future nor lacking in any past-present-future, neither dual nor non-dual, neither defiled nor pure. This contemplation of the Tathāgata is most rare, like space itself never going awry. Keep increasing your mindfulness of it, seeing the beautiful features of the Buddha in front of you as if you were looking at your own reflection in still water. First see it as this one Buddha, then as all the Buddhas of the ten directions. No miraculous power need take you far away to see these Buddhas: you see them and hear them preaching the Dharma right where you are. It is very remarkable indeed: having no definite form or attribute, and thus no seeing or hearing or knowing, [the Total Field of All Phenomena] admits of no realization, even by a Buddha. What is the reason? 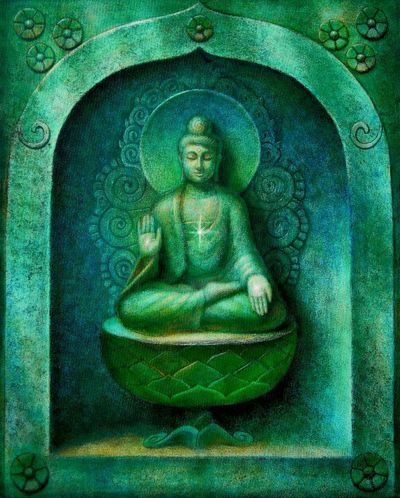 It is that a Buddha is himself precisely the Total Field of All Phenomena. To say that the Total Field of All Phenomena has a realization of the Total Field of All Phenomena would be contentious and meaningless talk. Rather, without any realization or any attainment, contemplate all the aspects of all sentient beings as aspects of Buddhahood, and contemplate the extent of the realm of sentient beings as the extent of the realm of the Buddha. The extent of the realm of a Buddha is beyond conception, and so is the extent of the realm of a sentient being. The realm of sentient beings dwells as space dwells: by dwelling in nothing at all, by its utter lack of any definite attribute, it dwells within enlightened wisdom itself. Since we can find no things that are mundane and deluded, what is there to abandon? Since we can find no things that are sagely and pure, what is there to achieve? The same goes for samsara, Nirvana, defilement, and purity. Not abandoning, not obtaining, dwell only in the ultimate reality. In this way, see each sentient being as the true Buddha, who is the Total Field of All Phenomena. See lust and rage and delusion and all other afflictive passions and disturbances as actions that are always already quiescent, actions devoid of any real motion, belonging to neither samsara nor Nirvana. Relinquishing neither false views nor the unconditioned, practice the Buddha path, for such a practice is neither practicing the path nor not practicing the path. It is called truly dwelling in each of the afflictive passions and disturbances, seeing each of them to be the Total Field of All Phenomena. In contemplating heavy karma, none goes beyond the five grave sins of killing father, killing mother, killing an arhat, shedding the blood of a Buddha, or sowing division in the community. But these five grave sins are precisely wisdom itself, for there is no definite mark of duality differentiating wisdom on the one hand and these five sins on the other. There is no separate entity that feels them, knows them, discerns them. The attributes of sin are precisely the attributes of the ultimate reality, for both are beyond conception and thus incapable of being destroyed, originally free of any original nature. All karma and conditionings [both sinful and virtuous] dwell in the ultimate reality, neither coming nor going, neither cause nor effect. This is the contemplation of all karma itself as precisely the authoritative signature of the Total Field of All Phenomena. The authoritative signature of the Total Field of All Phenomena is such that the four types of demon can never destroy it or abuse it. And why? Because the demons are themselves the authoritative signature of the Total Field of All Phenomena. How could the authoritative signature of the Total Field of All Phenomena destroy the authoritative signature of the Total Field of All Phenomena? The same idea can be applied to each and every phenomenon, as should now be obvious.